“Each Toscanini recording of Verdi commands repeated listening and study. That is certainly the case in the two complete Toscanini-led performances of Verdi’s final opera, FALSTAFF, preserved on disc (Salzburg, August 9, 1937, and NBC Studio 8H, April 1 and 8, 1950)….Over the ensuing years of his long and storied career, Toscanini conducted FALSTAFF in more productions and seasons than any other opera in his repertoire. It’s not surprising that both surviving complete Toscanini FALSTAFFs have been issued several times by various companies. 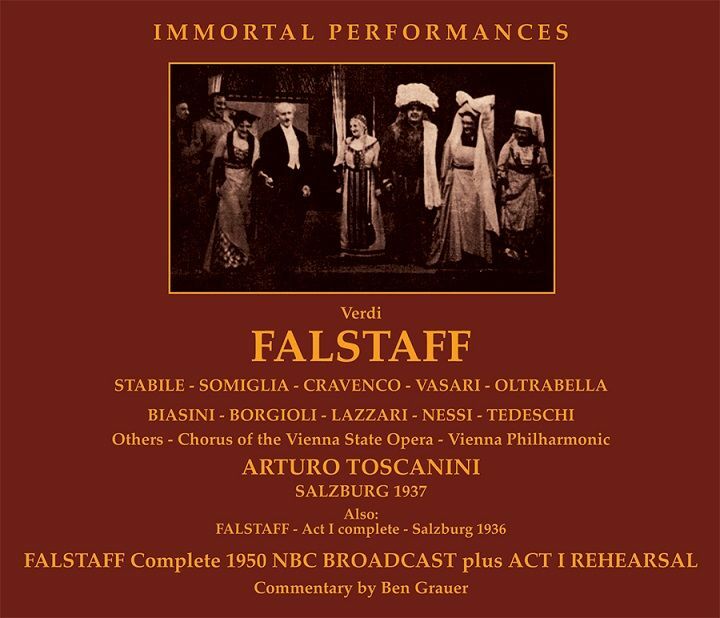 Now, Immortal Performances provides its own restoration of the 1937 and 1950 FALSTAFF performances, along with a complete Act I from Salzburg (August 29, 1936), and orchestral rehearsals of Act I for the 1950 broadcast. According to author and Toscanini authority Harvey Sachs, preparation for the 1950 FALSTAFF was a lengthy, intense process that included cast piano rehearsals over a period of six weeks, averaging six hours per day. 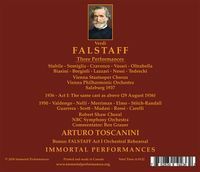 The Immortal Performances set includes extended excerpts from orchestral rehearsals for Act I….If you are at all a fan of this kind of document, the FALSTAFF rehearsals are a ‘must’. The legendary Toscanini temper is only occasionally in evidence. Toscanini fills in for the missing singers (both male and female), and in his familiar raspy voice, delivers the music and text with a clarity and involvement that touchingly reveal his intense love and sympathy for Verdi’s comic masterpiece. It’s also a wonderful reminder of how, courtesy of Verdi’s genius, the FALSTAFF orchestra assumes the role of a principal in the drama of at least equal importance to the leading singers. The lengthy and scrupulous period of preparation is certainly evident in a performance that crackles with precision, fire, and nuance, right from the boisterous opening measures to the concluding fugue….Falstaff is the Italian baritone Giuseppe Valdengo, the Iago in the 1947 NBC OTELLO, and Amonasro in the 1949 AIDA. Valdengo’s lyric baritone was probably not a natural fit for the rotund Sir John, often sung by rich-voiced bass-baritones. But Valdengo was always a resourceful and imaginative performer, with superb diction and a keen sense of opera’s theatrical potential. These attributes, honed during an extended period of preparation with Toscanini (starting seven months before the broadcast) resulted in an interpretation of true genius. 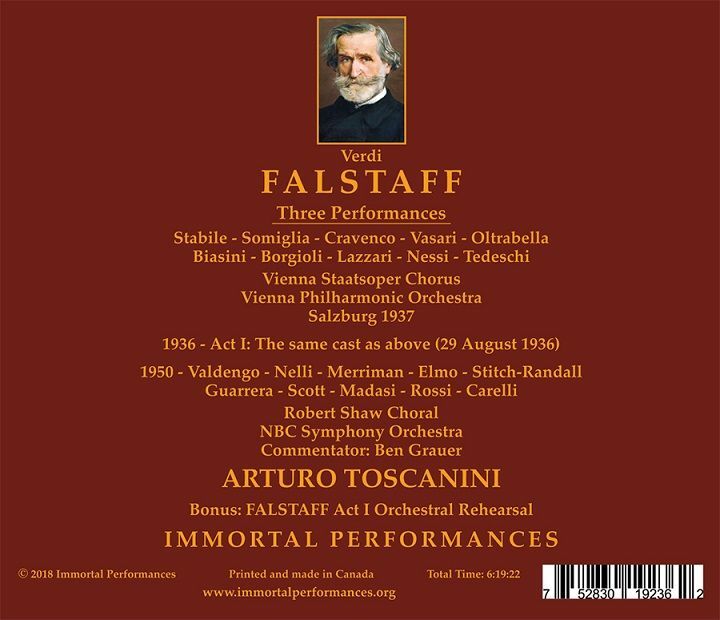 I rank Valdengo’s Falstaff, along with those of Giuseppe Taddei (Cetra), Tito Gobbi (EMI), and Geraint Evans (London) as the finest on commercial discs. Time and again, Valdengo (aided by Toscanini) offers touches that are spot on, and may even inspire you to laugh out loud….The remainder of the cast offers several additional top-notch performances. Nan Merriman (Meg Page), Cloe Elmo (Mistress Quickly), and Teresa Stich-Randall (Nanetta), a trio of great artists, approach the ideal in their respective roles. Herva Nelli, a regular presence in the Toscanini-NBC opera series, gives one of her finest performances as Alice Ford. Baritone Frank Guarrera, little more than a year into his long and valuable Metropolitan Opera career, is a virile and vocally secure Ford. The addition of Ben Grauer’s radio announcements, and audience applause (and sometimes, cheers) at the conclusion of each scene add to the sense of occasion. I assume that the three RCA CD issues of the 1950 Falstaff are derived from the concert master tapes. In the Immortal Performances restoration, Richard Caniell takes a different approach, working from test pressings made for Toscanini. In my estimation, Caniell has used that source material to produce the finest CD representation of this unsurpassed performance. It is true that the source test pressings have some surface noise absent from the RCA CD issues. But the basic sound quality strikes me as a noticeable and dramatic improvement….The best of all worlds would be Immortal Performances’ sound picture, but without any surface noise. Still, Immortal Performances emerges as the clear winner for me. As a performance, the 1937 Salzburg FALSTAFF is on an equally exalted level. In addition to Toscanini’s miraculous conducting, it boasts Mariano Stabile in the title role. Stabile sang Falstaff an estimated 1,200 times in his career, first at La Scala in 1921, under Toscanini’s direction. In the 1937 performance, Stabile sings with absolute vocal and dramatic assuredness and authority, and never a hint of routine. The rest of the cast is excellent as well. If only the sound quality approached the studio recordings of the period, or even first-rate contemporaneous broadcasts….Early CD reissues of the 1937 FALSTAFF tested the resources and patience of even the most veteran collectors of live historic recordings…relegating this magnificent performance to the status of a collector’s item more talked about than actually listened to….the Immortal Performances restoration of the 1937 Salzburg performance is an improvement over the estimable [out-of-print] Andante release. The voices are more focused, and placed in a warmer, less artificial and harsh acoustic. You will still not mistake this for a sonically first-rate broadcast of the era, much less of a fine studio recording of the time. But the performance is of the greatest importance, and the Immortal Performances restoration presents it in the best light. “Verdi was the only composer Toscanini knew personally. This personal association gives Toscanini’s performances of Verdi’s music an authority unique amongst recorded conductors; allied to which is the strange coincidence that Verdi was the first composer whose music he conducted - and the last….One could devote several thousand more words to the background and personal assessment of Toscanini’s approach to FALSTAFF in the course of this review, but the existence of both complete recordings (1937 and 1950), and the complete Act I from the 1936 Salzburg Festival, has not only been relatively common knowledge for many years, but the magnificence of the 1937 complete performance has been the prime reason for its appearance on several labels in recent decades. Not only is there a compelling commercial reason for this performance to be made available once more, but also it affords new listeners as well as those familiar with it to hear the vastly experienced restoration work of audio engineer Richard Caniell, who has, in my opinion, produced the most natural sound possible from the original unsatisfactory Selenophone film recording. In terms of the challenge Caniell set himself to produce a sonic transfer more faithful to the musical performance than had been achieved before, so far as I am concerned he has done that….In his detailed and compelling notes accompanying this set, Caniell explains the impetus which drives his work, and how he approached several of the conundrums which the original 1937 complete recording pose….Such has been the detailed application of modern recording technology to recordings from earlier eras that specialists - and general music-lovers, too, who take their love of music very seriously - can often be surprised at the ability of technicians to reveal more detail in older recordings than the reproducing equipment of those times could deliver. Toscanini enthusiasts, Verdi lovers, and collectors of great opera recordings will have to have this set - for reasons not solely concerned with Caniell’s restoration. The most obvious attraction is that these five CDs…contain every scrap of Toscanini’s surviving recordings of the one opera which he admired above all others in one package….Both performances of FALSTAFF…reveal Toscanini at the very height of his consistently considerable powers….in 1936 and 1937, he had the participation of four of the greatest dramatic Verdi singers of the era - Stabile, Biasini, Borgioli, and Somigli….Such is Toscanini’s overall control of the musical and dramatic aspects of these events that the increasing tension within the closing stretches of the act enables the drama to be played out in real time, the composer’s carefully wrought personifications being made with such clarity as to define the greatness of operatic conducting such as listeners experience rarely in a lifetime’s opera-going. Mariano Stabile’s Falstaff, Dino Borgioli’s Fenton, and Piero Biasini’s Ford in particular virtually define their roles for all time, but we must not forget that other singers in this production had also sung their roles under Toscanini’s direction at La Scala in 1929….Falstaff approaches the concluding pages of the very first scene - where, from his initial entry, we are immediately drawn to the voice and personification of character that Stabile creates in calling for more drink, thrust into the scene through Toscanini’s very fast tempo…these are aspects of this performance which, it is safe to assert, have never been heard with greater clarity and downright musical sense than here. Good as the [out-of-print] Andante restoration was, this new Immortal Performances set is to be preferred.